It is time to really allow you to define your body. Tightening and toning your body work hand in hand when it comes to our defining gel and our Ultimate Body Applicator. If you’re ready to make a change this is the perfect stop for you! These packs are your “base” packages. These are “groupings” of select products that our company has put together to give you maximum results! You will also receive a bit more of a discounted price by purchasing these packs compared to buying individual product! You can choose from any of our product packs to help you with your trouble areas and to help you reach your physical goals! You will be able to tighten your body, tone your body, and firm your body in as little as 45 minutes! What’s more powerful than ONE of our amazing It Works! products? How about FOUR of our best products working together in a developed system to deliver even better results! Get ready to experience “life-shaking” results with the It Works! System! It’s a system so simple we can explain it in three words: WRAP. REMOVE. REBOOT. 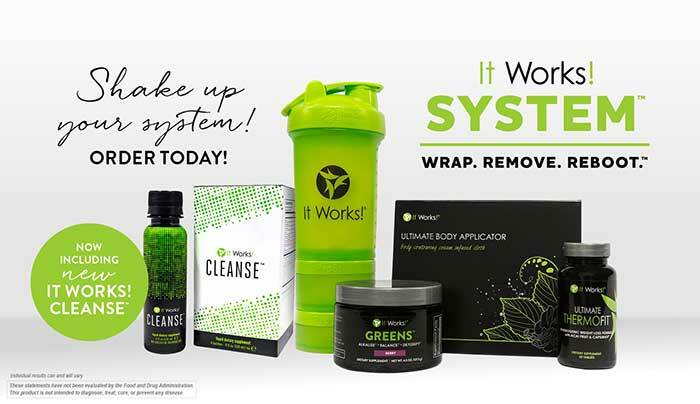 Shake it all up with the It Works! Blender Bottle—included FREE with your It Works! System! The It Works! Blender Bottle features a divided pill container for your Ultimate ThermoFit, two detachable containers for your two scoops of Greens Berry, and a Blender Ball to mix your Greens and water. You’ll be ready to WRAP. REMOVE. REBOOT. wherever you go! Our bodies are always trying to sustain that level and self correct intake of high acidic foods or environments. Greens helps give our bodies’ internal regulating system the boost it needs when trying to self-correct and restore alkalinity.